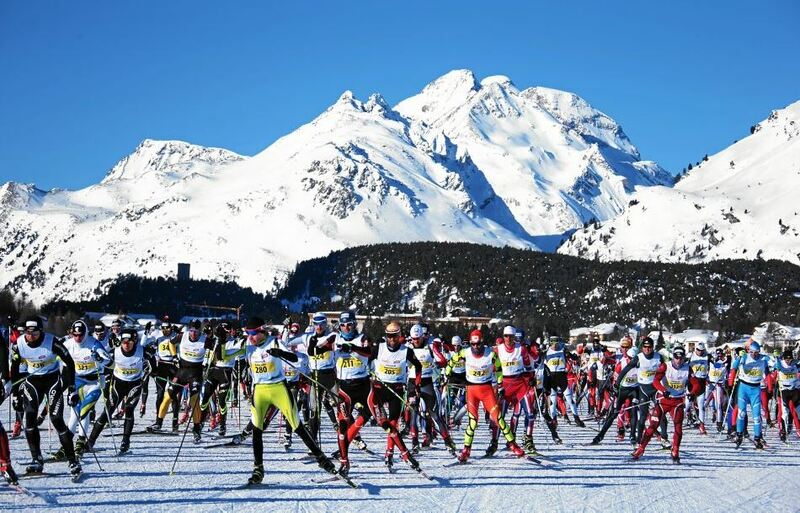 I just came back from an awesome trip to Europe to compete in the Engadin skimarathon. I started the trip in Ramsau, were I spent a few days adjusting to the European time zone with APU’s Pete Kling and SVSEF’s Chelsea Holms. 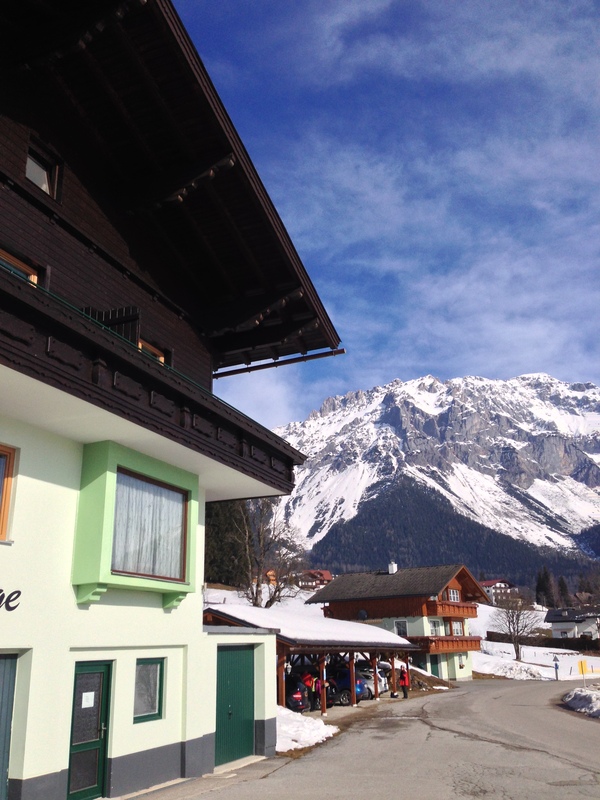 Ramsau is one of my favorite places in the world to ski and train, with a quaint feel and a laid back, relaxed atmosphere. We timed the trip just right – we got some serious sun with daytime highs in the mid 50’s and perfect skiing. There was still plenty of snow when we arrived, but with the rate it was melting I don’t think it would have lasted another week. Sun and snow at the Tischelberger in Ramsau. Testing some skis in the slush. The new Rossi’s have been CRUSHING it, and were on many podiums in Sochi. My pair felt great in the wet snow! After three days in Ramsau, we drove to the Engadin Valley, where we met up with the rest of the US crew, including Holly Brooks, Matt Gelso, Matt Briggs, and waxer Clarke Sullivan. The Engadin Valley is an incredible place, home to some of the most well known alpine and nordic skiing areas in the world. 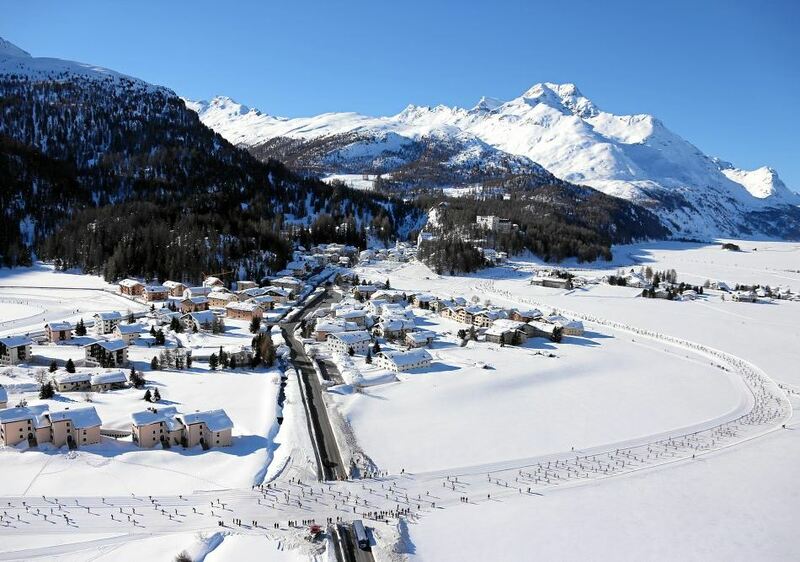 The ski trails wind down through the valley, running through iconic towns such as St. Moritz and Pontresina. 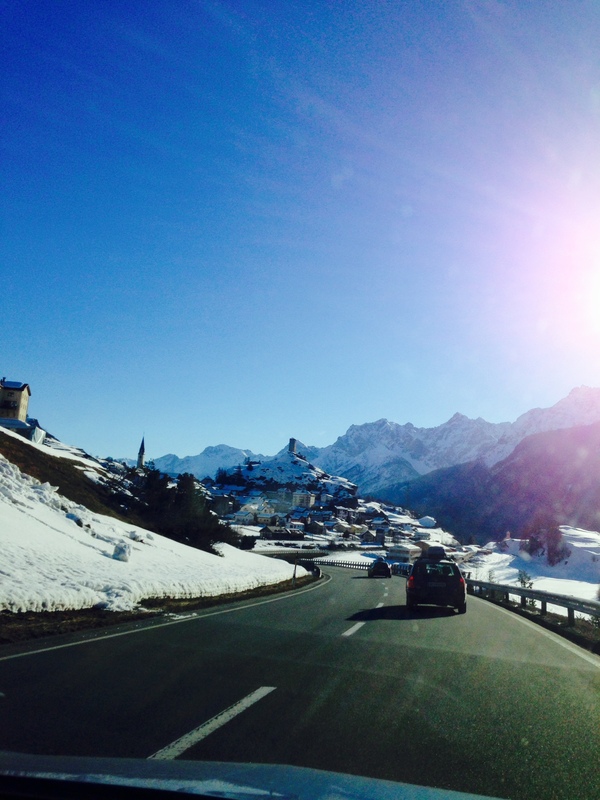 Driving into the Engadin Valley. 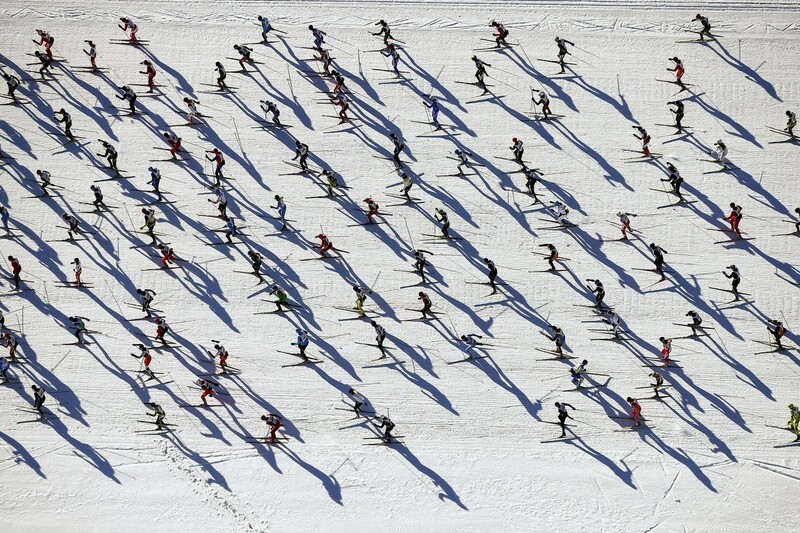 The action started with the St. Moritz night sprints right near downtown St. Moritz. The generous prize money attracted a strong field, and many World Cup sprinters flew down after the Drammen Sprints to compete. The atmosphere was incredible with tons of spectators. 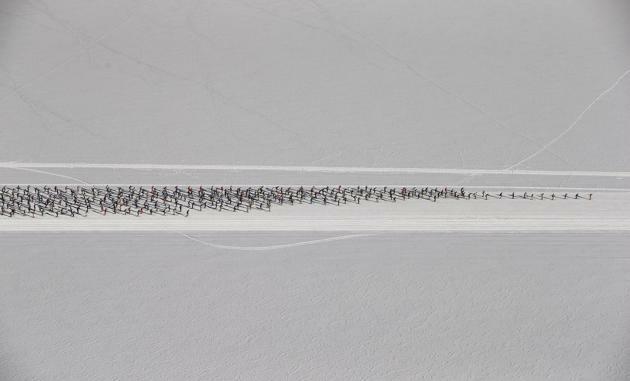 There was a DJ blasting music, leading what amounted to a dance party on the sides of the course, beer tents, Swiss cow bells, and the like. It was hands down the coolest sprint race I’ve ever done. The atmosphere was intoxicating and I felt more excited to race than anytime this year. This was my first time competing head to head with some of these guys, and because I didn’t have any expectations I decided to just go out and hammer. The day started with a 500m qualifier, followed by 1000m heats and a 1700m final. The course was a figure-8 of sorts, and the qualifier ran in the opposite direction of the heats (this is important later). 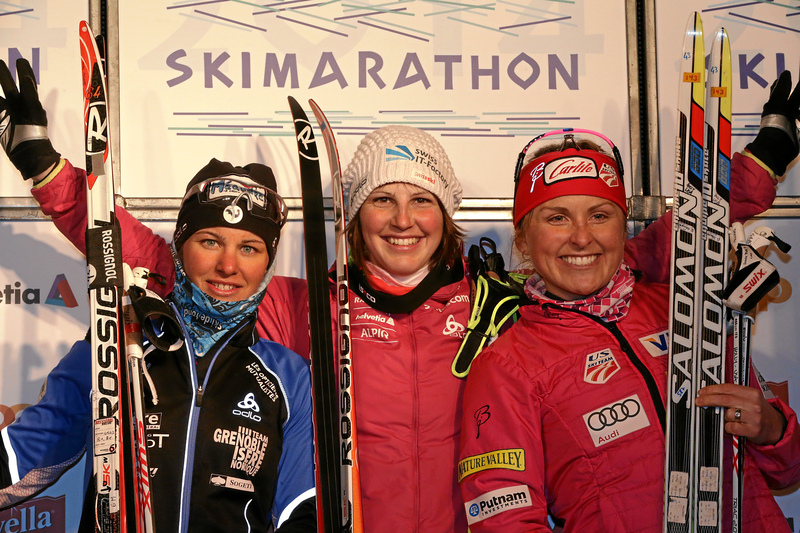 I had great skis in the qualifier – Clarke did an incredible job waxing and I knew from the moment I started that I had a shot if I could stay on my feet. I tried to stay smooth and relaxed over the chewed up snow and carry my speed efficiently. When I crossed the line they started announcing the heats and I couldn’t believe to hear my name in the mix with names I’ve heard all year on the World Cup – Nikolay Morilov, Anders Gloeersen, Josef Wenzl, Gianluca Cologna, and others. 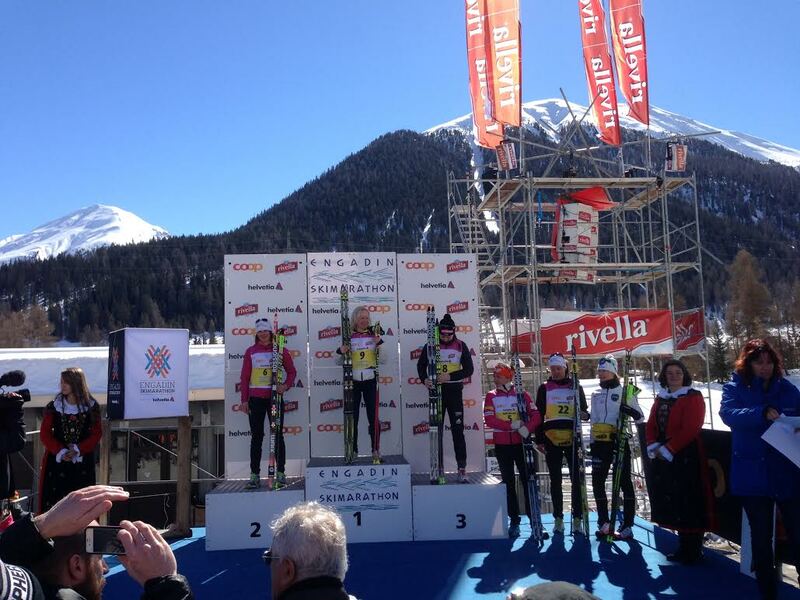 My heat had Cologna, Gloeersen, and two other Swiss team sprinters, and an Italian. I could barely believe I was lining up next to those guys. Gloeersen was 4th in the Olympic sprint and won a world cup earlier this year. I decided to just go out and hammer and see what would happen. The gun goes off! Gloeersen in lane 1, I’m in lane 2, Cologna in lane 3, etc. Thanks to Holly Brooks for the photo. I had the best start I’ve ever had in a sprint, and got out into the lead off the gun. With the narrow course, position was really important and it was almost impossible to pass. I lead almost the entire heat and was just on autopilot, letting the skiing happen by itself. I found myself still in the lead on the final climb seconds before the finish. I thought I had it, when I tangled with Gianluca and went down to the snow. I finished 5th in the heat, Gianluca was 6th. It was a huge bummer, since I think I had a good shot at the podium. It was still an awesome experience to be in the mix with those guys. Holly Brooks skied well in the heats and ended up in the money! I’m looking forward to coming back in future years. 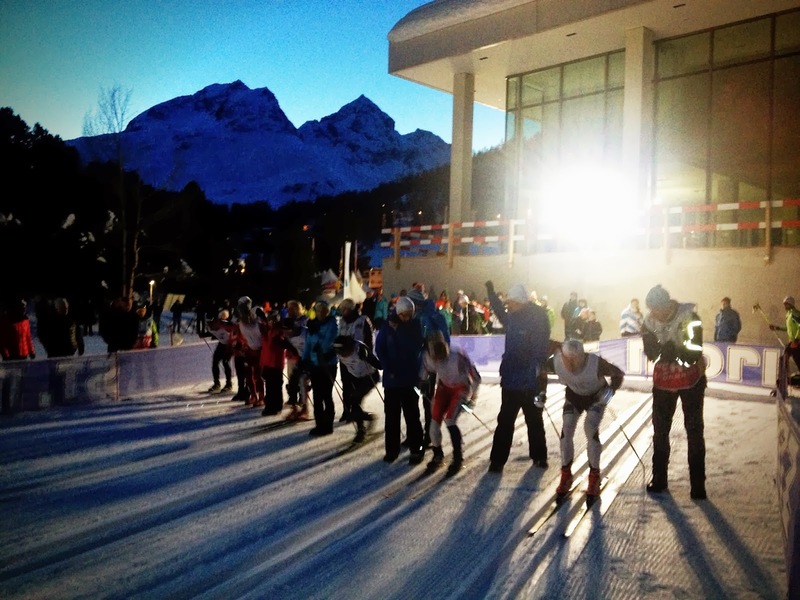 Holly Brooks in 3rd at the St. Moritz night sprint. Two days after the night sprint was marathon day. I’ll let the photos do the talking. Click on the pictures to enlarge! At 7k, my pole snapped unexpectedly. Everyone I asked refused to give me a replacement (I can’t blame them – how would they ever get it back!) I probably asked 60 coaches for a replacement, waving the broken stub above my head while no pole skating with the lead pack. I hung on for maybe 4k before my legs flooded and I dropped off. Still just one pole. This pic is from around 10k. 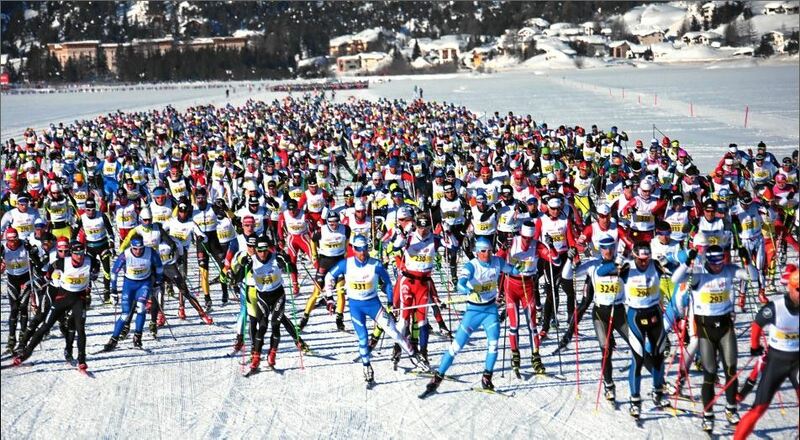 After 13k of one-pole skiing I got a new pole entering Pontresina at the 20k mark. I somehow had missed the pole service station in St Moritz. 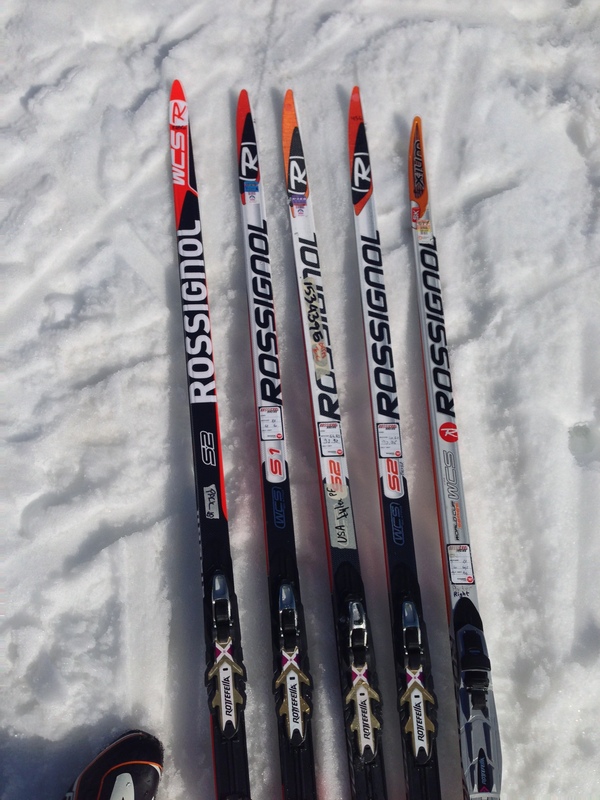 Clarke (our wax tech) had our spare poles in Pontresina itself at 21k, so 1k later I switched the loaner pole out for my own and got back on course. I decided to hammer – I had a lot of catching up to do and 21k left to go. I resolved to catch as many people as possible. A lot of people have been extremely generous in supporting me, so giving up was not an option! At the end of the day, it was definitely a bummer to end up so far back, but given everything that happened I was happy with how I skied. The one lesson I learned for next year is to put your EMAIL address on you poles right below the grip. That way, if you break a pole, you can ski right up to a coach with replacements, and make the transaction personal. Point to the email address on your stub and hand that over in exchange for the pole. This way, they at least have some way to get in contact with you to get the pole back. I skied along, yelling for a pole and waiting for one to be offered to me – surprise, it never happened. The key is to make it personal. 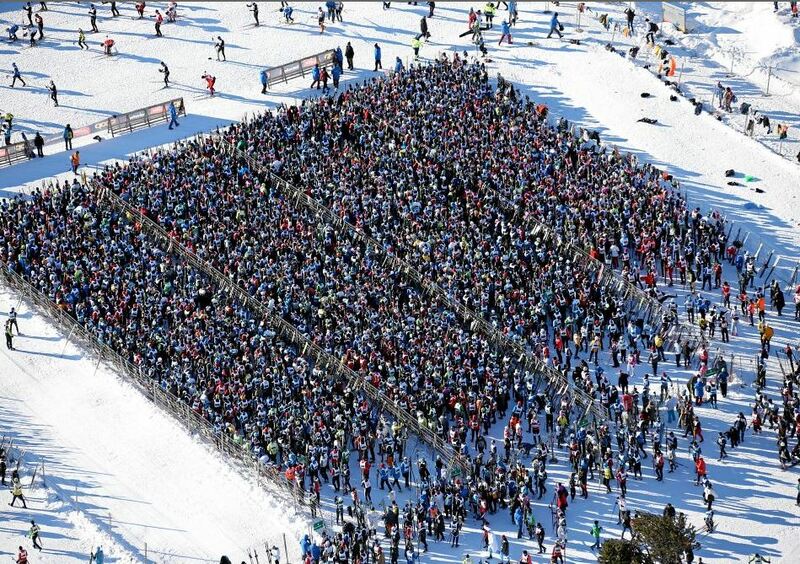 Two US skiers had great days – Matt Gelso skied a strong race to finish in 16th, 11 seconds out of the win. Holly Brooks finished in 4th after an impressive showing. Women’s podium with Holly in 4th. 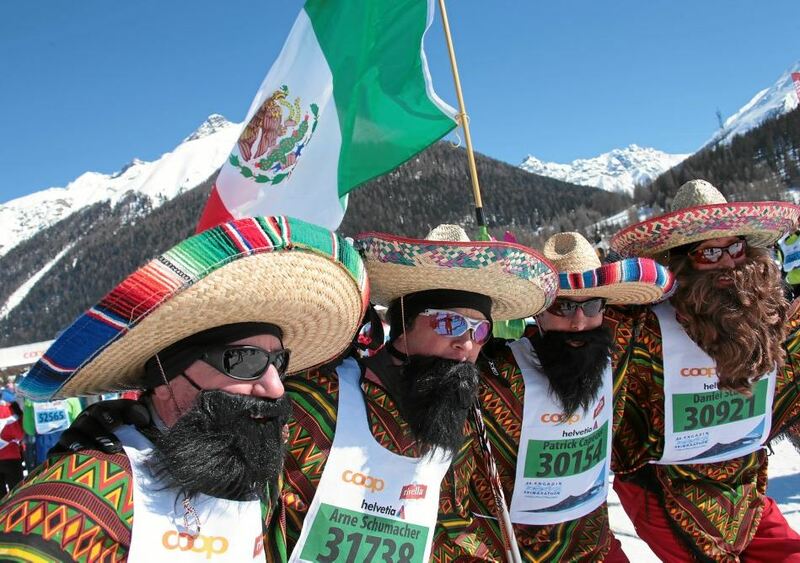 The spirit at the Engadin is incredible! 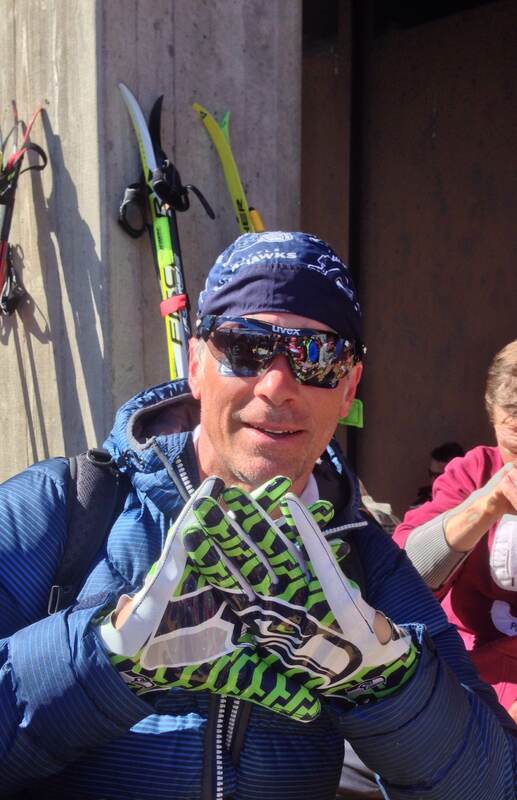 Tony Wiederkehr showing some Seattle spirit. Tony was instrumental in organizing the trip and deserves a huge thanks! 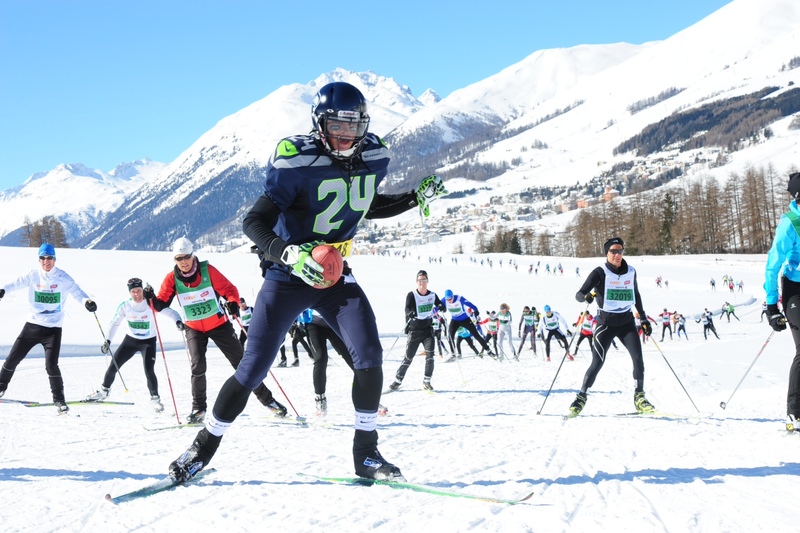 Tony also skied the whole 42k in a Marshawn Lynch costume, complete with regulation pads, jersey, and helmet. To make it authentic, he went with no poles and cradled a football. It was awesome! Thanks Tony! It was an awesome trip. Thank you to everyone who helped make it happen. I am back in the US, racing the Craftsbury Spring Tour this weekend in Vermont, and then Supertour Finals in Alaska next week. Till next time! This entry was posted in Blog and tagged Engadin Valley. Bookmark the permalink.